Genuine OEM Epson Ink Cartridge, Light Black. 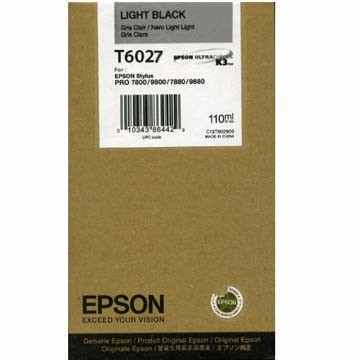 Epson part number: T602700, T6027. Remanufactured Epson Ink Cartridge, Cyan, 1,900 page yield. Cartridge is filled with Pigment based ink. Replaces Epson part number: T603200, T6032. Remanufactured Epson Ink Cartridge, Magenta, 1,900 page yield. Replaces Epson part number: T603B00, T603B. Remanufactured Epson Ink Cartridge, Yellow, 1,900 page yield. Cartridge is filled with Pigment based ink. Replaces Epson part number: T603400, T6034. Remanufactured Epson Ink Cartridge, Light Cyan, 1,900 page yield. Cartridge is filled with Pigment based ink. Replaces Epson part number: T603500, T6035. Remanufactured Epson Ink Cartridge, Vivid Magenta, 1,900 page yield. Cartridge is filled with Pigment based ink. Replaces Epson part number: T603300, T6033. Remanufactured Epson Ink Cartridge, Light Magenta, 1,900 page yield. Replaces Epson part number: T603C00, T603C. Remanufactured Epson Ink Cartridge, Photo Black, 1,900 page yield. Cartridge is filled with Pigment based ink. Replaces Epson part number: T603100, T6031, T563100. Remanufactured Epson Ink Cartridge, Matte Black, 1,900 page yield. Cartridge is filled with Pigment based ink. Replaces Epson part number: T612800, T6128. Remanufactured Epson Ink Cartridge, Light Black, 1,900 page yield. Cartridge is filled with Pigment based ink. Replaces Epson part number: T603700, T6037. Remanufactured Epson Ink Cartridge, Light Light Black, 1,900 page yield. Cartridge is filled with Pigment based ink. Replaces Epson part number: T603900, T6039. Remanufactured Epson Ink Cartridge, Light Vivid Magenta, 1,900 page yield. Cartridge is filled with Pigment based ink. Replaces Epson part number: T603600, T6036.